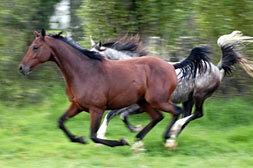 At Henham Stud, the emphasis of our horse breeding is temperament, toughness and ability. 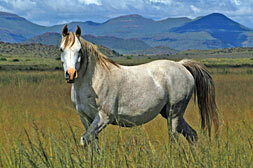 Our horses are reared 'hard' in the veld of the Karoo. For the first three years of their lives, the young Henham horses remain on the veld where they grow slowly with good strong bones and they learn to be surefooted and clever. When they are ready to be broken in, they come back to the stables and are carefully taught the routine so that they can begin their next phase without losing their spirit or initiative. Judging from the results of the horses competing, they seem to have got what it takes. Our stallions and mares are all percentage Crabbet Arabians who have themselves or their close family performed well in endurance rides. All the horses carry multiple lines of Raktha, Grantchester, Blue Domino and Grey Owl. 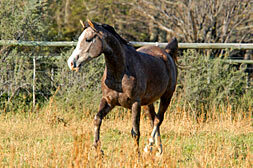 Many of the horses bred at Henham have been consistent winners regardless of the weight category or equestrian discipline, and they feature yearly in the provincial teams. From the oldest crabbet stud in South Africa, this stallion carries multiple lines of the great Crabbet stallion Raktha as well as all the foundation mares of Olford Stud within his first 6 generations; namely Serafilla, Dancing Crystal, Silverlet. His pedigree reads like the who's who in all the old Arab bloodlines, as almost all the top Crabbet names can be found in this pedigree. Olford Seraoud is a very well-conformed individual with very good bone and exceptional movement. 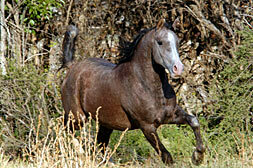 He has a wonderful gentle nature and we believe that he will complement any type of mare. 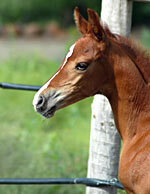 If you would like to know what horses we have available for sale, contact us. Springbok colours riding National Ride (200km) in 8h16; 8h45; 9h02. Winner of many 80km rides , average speed 1997 for 3 rides 24.31 km/h. 1st light weight at National Ride (200km) in 9h32 and winner of many 80km rides in Springbok qualifying times. WP team; Heavy weight winner of many 80km & 160km rides. Best conditioned, carrying 108kgs; winner and placed in Egypt and Dubai; 4th in the World Challenge in Dubai, only 16 horses finished from 106 starters. 3rd Heavy weight at National Ride (200km) in 1997. Heavy weight winner & best condition, now competing in Dubai. WP team 99 & 2000, placed and has done 3000kms; completed 8 seasons, now breeding. 2000 winner at National Ride - Fauresmith. WP team at Nationals ?98, winner of 80km in Springbok times. WP team at Nationals ?99, 3rd place and 2nd best condition at Nationals ?99, winner over 80km in Springbok times . Junior Springbok 2000. Winner and best condition first season 2001; 3rd heavy weight Nationals 2003; 1st Heavy weight Nationals 2004; Springbok colours. Winner over 80km and 120km, best condition; exported to Bahrain. International A-Grade, Grand Prix winner; at the age of 20+ he won the SA Junior Show Jumping Championship. JA, exported to America , now international A grade. CA +8, Intermediate Eventing + 23, CE +9 dressage. Open equitation; Sappi winner 2001. WP jumping team 2000 & 2003; WP eventing team 2000, 2002 & 2003. CA +8; Champion Show Pony at East London ?99. Open equitation, WP equitation team. Consistently placed in showing and show jumping. CC professional; CN +11 dressage; Intermediate eventing; Supreme champion working pony; WP showing team 2003. S.A Champion under12 months ? Partbred Welsh at National Championships 2000, S.A Junior Champion Partbred 2001. S.A Junior Champion Partbred 2003. S.A Champion Partbred under 12 months 2003 at 6 weeks old.